Tempted to try your hand at homesteading? Maybe grow your own bean and broccoli sprouts, make echinacea and St. John’s wort tinctures, or brew up your own batch of kombucha? DIY projects like these can be fun, empowering, and economical ways of enhancing our lives and our sense of well-being. And of course, DIY is the ultimate form of acting locally. The question is how to get started. 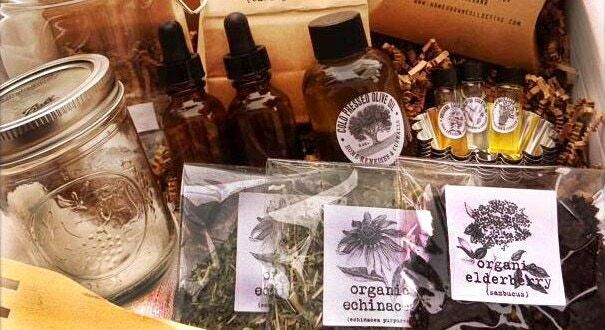 The Homegrown Collective is a company dedicated to promoting the DIY ethos by providing its members with products that foster self-sufficiency and promote sustainability. Here’s how it works: For a fee, each month Homegrown Collective sends its subscribers a “GREENBOX,” which contains professionally curated items designed for a particular seasonally appropriate DIY project (for example, the ingredients for home-brewed hard cider for the holiday season). And no, having a backyard garden is not a requirement for any of these projects. Mitchell Rose, the founder of Homegrown Collective, says he started the company after having trouble finding a trusted source that not only vetted green and sustainable vendors, artisans and small businesses, but also made them accessible to everyone. “I felt that the eco-friendly and sustainable consumer landscape was confusing, and a little bit intimidating for the ‘green-curious,’” Rose states. “There was a void that I recognized needed to be filled. By acting as your ‘eco-concierge,’” Rose adds, “the Homegrown Collective provides a road map, direction, and products that people can trust, as well as a community to go to for questions, answers and shared stories. “The great thing about our boxes is that they are bite-size ways to experiment with eco-friendly and self-sustaining practices,” Rose continues. “Each box is an educational, fun project for the individual or the whole family—and the best part is that with every box comes a new skill learned. “There’s a great sense of gratification that comes with knowing how to use soap nuts as a chemical-free, effective laundry practice, or understanding how easy it is to make your own mozzarella cheese from your own kitchen—every ingredient accounted for—or having the ingredients and know-how to re-create your own natural home remedies for better health and a stronger immune system,” Rose explains. Past GREENBOXES have included DIY ingredients for coconut lip balm, Meyer lemon preserves, paraffin lamp oil candles, homegrown herb kits, and wool dryer balls. Receiving the monthly GREENBOX is just step one of the experience. In addition to an online community of users to turn to, Rose assures us that every phone call, e-mail and voicemail gets a personal response, and that the Homegrown Collective values all feedback because it informs the company’s growth.